If you are fed up with trying to wrap Microdata html around your pages content then these Local SEO tips for implementing Local Business structured data markup with JSON-LD is for you. I break down Local Business structured data for a selection of Local Business types that can be amended to suit your business type and how to add it sitewide or page level. Google does not always support schema.org markup as it becomes available. 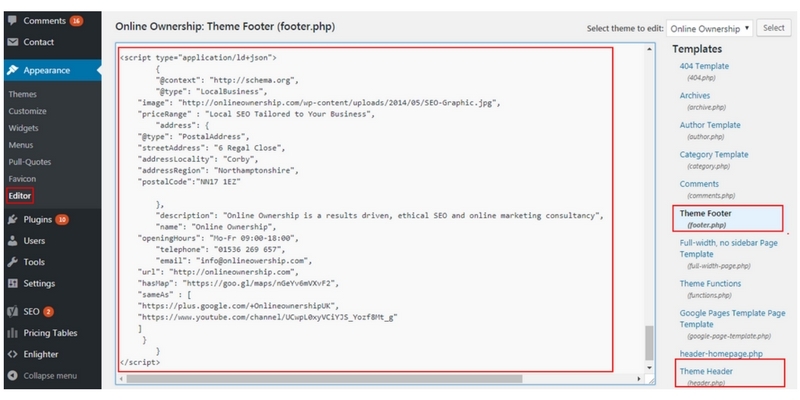 Use Googles structured data testing tool to see what is recognized and supported. I include sameAs to add your business social media profiles. You can also add top level business citations, by top level I mean BBB, chamber of commerce, companies house listings or other high authority review sites that you may be using. Check http://schema.org/LocalBusiness to see if your business type is specifically included, if not use LocalBusiness as default until it is supported. priceRange in the above is listed as “Best Rate Guaranteed”, depending on your buisness it could also be, “Free Quote Available”, “Priced on Quote” or if you do have an actual product price range you could use “£10 – £25”. I recommend that single location businesses also include the business contact details within their sites footer, after all you want your customers to find you. In this instance it is a Real Estate Agent with two locations. "name" : "Name of Main Business"
"Social Channel for Business Location"
Locate your business listing in Google Maps. Use the hamburger menu (top left search bar), select share or embed. In this structured data the business is a Taxi service, but it could be a plumber, electrician, locksmith, any business that provides the service within a certain area. "Your Gov Taxi Licence Page"
Make sure you select the mid point of your service area for the GeoCoordinates. The radius is in miles. This is a basic hotel structured data markup, for variations that include reservations, aggregate ratings and properties within a hotel, like restaurant or spa, please visit my hotel structured data guide. For a local business with one or two location I recommend adding it sitewide in one fell swoop. If you are using WordPress this can be added to the header.php file or footer.php file but this will depend on how your site was originally built. If selecting the header or footer it should be at the end of your file content. In most WP sites dashboard, select >> Appearance >> Editor. If you cannot locate the header or footer files and the CMS use blocks, add an <HTML> block to your footer and add the structured data within <div> < /div>. As a last resort you can past on a page by page basis, again by adding within <div> </div> at the bottom of each page. Test all your implementations with Google’s structured data testing tool.